You have heard about Amazon Fire TV. Now hear about Amazon Fire TV Cube. Voice control efficiently works with other smart home devices as well. Content on Google Play is not supported currently. The new and official Amazon Fire TV Cube is able to combine the greatest features of the very impressive Amazon Fire TV with features such as hands-free fast voice control along with Alexa capabilities which are already present in Echo. The official Amazon Fire TV Cube is the complete media streamer for any online consumer. Amazon has developed and heavily marketed a good number of streaming devices. A lot of those devices have had no problems in offering features such as the official Alexa voice virtual assistant, Amazon voice search and of course, voice commands. None of these features are new as they have been around for a couple of years now. In order to use any of these features, all that the user has to do is to take the remote and press the relevant button and then speak via the pinhole microphone in order to give Amazon Fire TV commands with nothing but his/her choice. Most of you would already know that if a user has an Echo Dot or an Echo or any other new Amazon device which allows him/her to make use of Alexa with a single and short wake-up word then he/she can actually pair that device with Amazon Fire TV device in order to control his/her complete streaming media experience with nothing but his/her own voice. If you do not fancy doing all that stuff then you can get Amazon Fire TV Cube for just $119.99 and get each and every feature that other Echo and Fire TV devices offer, all in one. That includes hands-free and voice control of one’s home theater. Our research shows that the Amazon Fire TV Cube device makes use of an efficient far-field microphone array which is able to pick up the user’s voice clearly and can activate Amazon’s digital assistant Alexa with a single wake word. The user does not even have to press a button and make use of the single mic which is present on the remote. As for the price, you do not need to do much math to figure out that Amazon Fire TV Cube is more expensive when compared to Amazon Fire TV Stick or Amazon Fire TV device. However, we feel that since this new device also offers the hands-free Amazon Alexa commands, that alone makes it a pretty worthy media streamer for online consumers who have never purchase Echo or Amazon Fire TV devices. 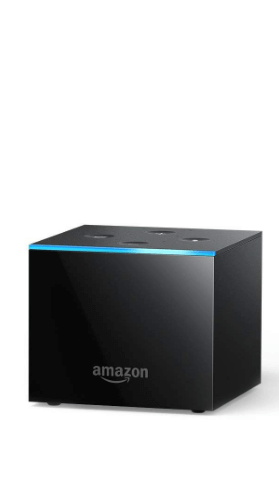 Despite its name, the official Amazon Fire TV Cube is actually not a perfect cube. But it has a near-cube shape which measures (in inches) 3.0 (height) by 3.4 (width) by 3.4 (depth). Each side is at a sharp 90-degree angle with the edge. As for the looks, our research shows that the sides of the Amazon Fire TV Cube are made out of plastic and have a glossy black look. There is also a panel on the top that has a somewhat matte black finish with less shine. As for the front face, it features the Amazon logo which looks like it was etched. Moreover, there is also a translucent sort-of bar near the tp edge of the device. Whenever Alexa is busy in listening to stuff, this is where the bar lights up in blue. The Amazon Fire TV Cube’s top edge also features a total of eight pinholes. These are the holes that the device makes use of in order to have success in picking up signals via the far-field microphone array. In addition to the four standard buttons that one can find on almost all Amazon devices named Echo, there are the Volume Down/Up button, the Microphone Mute button and the Alexa button (sometimes users may want to activate voice control manually without making use of the wake word). As for the base of the cube, it sits neatly on four rubber feet. All of them are shallow. Their main function seems to be to just lift the whole of the device a little bit so that the speaker firing downwards at the bottom is able to make itself heard. As expected, the back of the new Amazon Fire TV Cube has a connector where the power adapter can connect. There is also a spot for 3.5mm jack. Apart from that, there is the infrared blaster along with a micro USB port and an HDMI output. Yes, there is no Ethernet port. Of course, you can purchase one on your own and use that with the micro USB port for a wired connection. Just that you know, the Amazon Fire TV Cube does come with a dual-band 802.11 ac WiFi. Some have found the presence of an adapter as puzzling since Amazon Fire TV Cube does have a good amount of space at the back for another port. The Amazon Fire TV Cube also comes with remote control. It is almost identical with the one that comes with Amazon Fire TV Stick and Amazon Fire TV. The remote is narrow, simple and around 6-inches long. It is black and has a plastic feel to it. The navigation pad on it has a glossy finish and is circular in shape. Flanking that, is a microphone button. There is also some playback control and menu buttons near the bottom. The mic button has a pinhole microphone just above it. And users can make use of that to command Alexa via the provided remote rather than having to shout at Cube’s microphone. The presence of a button means that users can make use of Alexa with its wake word. Amazon Fire TV Cube connects to the remote via Bluetooth. That means you never have to worry about having a line of sight in order to have it working for you. Our research shows that the remote does not offer volume control buttons. We feel it is a missed opportunity since Cube has the ability to adjust the user’s TV volume. It even comes with a speaker and there are separate volume controls for that as well. Users who want to modify the volume on their TV via the Cube can make use of voice controls to do so. Users who want to modify volume settings on the device itself will have to press the relevant buttons on the Amazon Fire TV Cube itself. Setting up the Amazon Fire TV Cube is not difficult at all. That holds true especially if you have managed to sign up for an Amazon account already. Remember, that you do not need to have an Amazon Prime account to set up Cube. Of course, if you want to consume Prime Music content and Prime Video content then you will need an Amazon Prime account. In any case, what you need to do is to plug your Amazon Fire TV Cube in your TV and then connect it. After that, use the Pause/Play button in order to activate the Cube. Once you have done that you need to enter the setup mode. The actual process is made easier by all the on-screen instructions that you will see. So walk through them and connect your Cube with your private WiFi network. After that, you need to sign in using your official Amazon account. If you do not have an Amazon account then you will need to create one during the installation process. After you have managed to sign in, we want you to select all the additional services and apps for various different purposes. If you want some live TV content then install applications such as PlayStation Vue, Sling TV and/or Hulu. For premium channels, you may want to give Showtime and HBO some thought. For sports, you may want to have a look at ESPN. When that is done, the new Amazon Fire TV Cube will make attempts in order to identify the user’s TV set automatically via the present HDMI connection. The device will also test the provide remote control and its comments by first turning the remote on and then off again. If and when this process does work, Amazon Fire TV Cube should have no problems in turning off the user’s TV set and turn it on along with adjusting the TV’s volume and also switch inputs with nothing but voice control commands. On that note, do keep in mind that Amazon Fire TV Cube can and does control a multiple number of home theater internet-enabled devices simultaneously. You can thank features such as infrared blasters, networked controls and HDMI-CEC for that. As for the Amazon Fire TV Cube itself, all four of its dies have IR emitters. The box also provides an additional IR blaster that users can place near to their internet-enabled devices inside theri cabinets or any place that may be outside of the infrared range of the Cube. For cases where you have changed your home’s theater setup after you have configured the Cube, you have the option of using the provided Equipment Control menu in order to add any additional devices to the available command list. Using the same menu, you can tweak commands belonging to individual devices. Moreover, you also have the option of going through the whole equipment setup wizard again if you want to start from the very beginning. 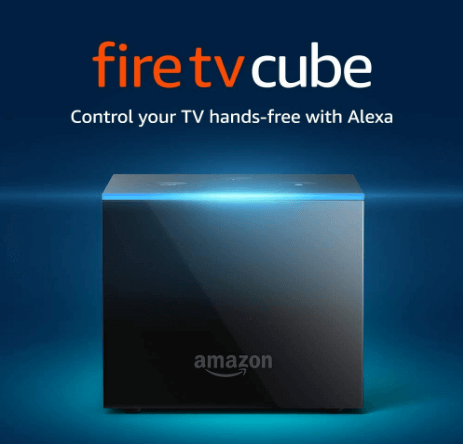 It goes without saying that once you have managed to set everything up, the Amazon Fire TV Cube will act and look just like a standard Amazon fire TV. Of course, Cube does have its additional features such as the hands-free voice control. If you want to then you have every opportunity to treat your new device just like an Amazon Echo device. You have the option of waking the new device up by simply saying, Alexa. Not only that but you can also talk to the device without ever bothering to touch the provided remote. We have already mentioned that the Amazon Fire TV Cube comes with a powerful enough microphone array which is able to pick up any words that come out of the user’s both even in a large living room environment. And since it is highly likely that a given user would have Amazon Fire TV Cube somewhere near their TV set or a soundbar that is connected to their TV set, Amazon (the company) has recently mentioned that it has actually improved its microphone’s sensitivity over various other Amazon Echo devices in order to make it better hear the user’s voice when the actual audio is originating from connected speakers or the TV. Amazon still recommends that users should place the Amazon Fire TV Cube at least one foot (preferably two) away from all powered and active speakers in their home entertainment theater setup. And that, by the way, includes the TV set itself. 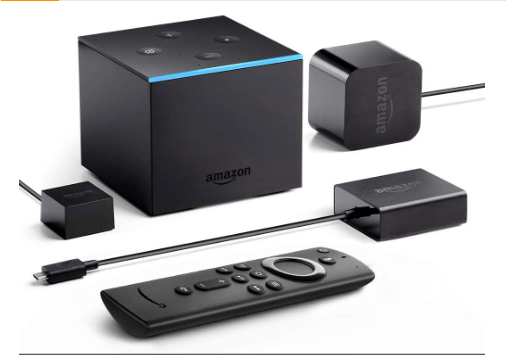 The Amazon Fire TV Cube, for the most part, offers users the same hardware as other Amazon devices such as Amazon Fire TV. In fact, the only prominent difference is that the Amazon Fire TV Cube comes with a total of 16 GB of fast storage space for applications. That is actually twice the storage space that Amazon Fire TV and Amazon Fire TV Stick offers to users at 8 GB. Our research also shows that Amazon Fire TV Cube supports pretty much all the services and apps that are available for Amazon Fire TV. The only missing piece is lack of access to Google apps. All of them are absent. In other words, owners of Amazon Fire TV Cube cannot access Google Play Music or Google Play Movies & TV. 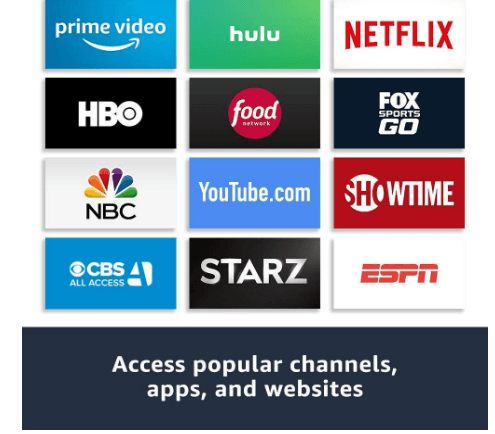 If you want to access YouTube on your Amazon Fire TV Cube then you have no other choice but to make use of the pre-installed Amazon Silk web browser. You can also make use of the Firefox web browser to do the same. With that said, we should also mention that the overall YouTube experience on all such third-party web browsers is essentially the same to the official YouTube app available on Android TV. The web browser version of YouTube also supports voice controls and search. As mentioned just now, users can access the world of the web with the help of Silk browser and Mozilla Firefox. Our research shows that these web browsers are fairly intuitive to make use of. Both support the navigation pad that is available on the provided remote. Using that remote, users have the option of controlling the pointer on the screen. There is no touchpad or air mouse functionality that some users may want to make their overall experience more computer-like. We feel that even without Google services and apps, the platform is actually a powerful one as far as Smart TVs are concerned. There are plenty of services and apps that users can make use of in order to make their life on the web more meaningful and productive. We have also come to know that Amazon Fire TV Cube comes with a good number of media playback capabilities. It is probably on par with Amazon Fire TV in that respect. More specifically, Amazon Fire TV Cube can output at 4K resolution and also supports HDR or High Dynamic Range and that too in HDR10 format. Amazon Fire TV Cube does not support Dolby Vision. Our research shows that you should not have a problem in working with voice commands on the Amazon Fire TV Cube. And that should hold true even when you are giving it commands over TV audio. You should also have no problems in pausing and resuming video command using just your voice commands. Voice commands also work when it comes to unmuting and muting the TV. You can also use voice commands to lower and raise the content’s volume. Want to disable or enable subtitles? You can do that completely hands-free. With all of that said, we do think that you will run into occasional problems while searching for unusual names. So watch out when you give it commands to search for your favorite youtube channel because it can mess that one up. Of course, such errors are very very typical for any and all voice search engines. Our research also shows that Alexa is actually pretty good when it comes to keeping track of the user’s activities and then using that information to give it some context when the user is issuing voice commands. That still does not mean it won’t make any errors if you use your Amazon Fire TV Cube a lot. To take an example you could give it the voice command to open up SyFy on Hulu. And as a result, it could show you search results for the genre ‘sci-fi’ within the official app. Other times, it could direct you to download the dedicated SyFy app. Of course, changing voice commands can have an effect on Alexa’s performance as well. Instead of saying ‘watch SyFy on Hulu’ you could try something such as ‘ tune to the official SyFy channel on Hulu’. We would like to mention here again that everything that we have mentioned so far in this section are just quirks. Moreover, these are quirks which are present in all voice controlled assistants. Comparing all the digital assistants though, we feel that Google Assistant is more flexible than Alexa when it comes to processing natural language. Alexa seems to want the user to use more formal syntax when giving voice commands. This neatly leads us to our next point which is that voice commands, though functional, are actually not that ideal for any and all situations. And since Amazon is the most valuable company in the world for nothing, it also has recognized that. Perhaps that is the reason why it has made the decision of including a conventional remote in the Amazon Fire TV Cube box. In an ideal situation, you would want to use voice commands 50 percent of the times while using the remote the rest of the time. Voice commands are great when it comes to broader playback controls, loading channels, apps, adjusting volumes and watching shows. In fact, voice commands make that process not only easier but also quicker. It is good enough to enable users to ignore their remote controls for a large portion of their time streaming something on the internet. However, when it comes to activities such as navigating menus and browsing web content, we find that the remote control is more convenient and faster. Amazon Fire TV Cube should work just as well even without voice controls when it comes to loading applications, playing videos and navigating menus. You should not face any problems when trying to load 4K HDR video over streaming services such as Netflix rather quickly over a fast WiFi connection. And since Amazon Fire TV Cube can handle that, it should come as a no surprise that it can also do the same for 1080p live channels which are available on Hulu. If you want to jump between various different Fire TV menus and apps then that should feel as responsive and snappy as anything else as well.